This chocolate church is made from a mold. Its 6" long. You pour and mold the chocolate for each piece of the church building separately and then assemble the completed church building after everything has set..
What a beautiful job on your church made out of chocolate. I'm guessing it might be for Easter? Really, though, this is the type of chocolate mold that can be used for any number of special events at a church or for a church group activity - even a wedding. Even though this type of chocolate work seems a bit fiddly, I bet it's a whole lot of fun! I'm sure when other chocolate candy makers see your gorgeous creation, they are going to want to give it a try themselves. 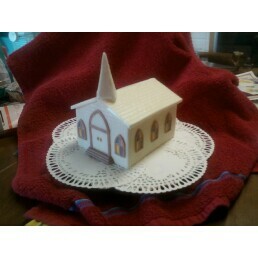 :) So, for that reason, I did a little searching to find a church mold for anyone interested. Now, I do hope all of you will come back and add your lovely chocolate molded churches here when you are finished, just like Sandra did! Can't wait to see them!